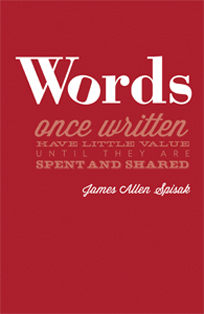 James Allen Spisak is proud to share his first published work, Words, with you. He was married for 51 years to his beloved wife, Betty Lou. His children, James and Lisa, are proud of their dad’s accomplishments, as well as forever grateful for his love and dedication to his family. James is a veteran, having served in the Korean War, and is active in his church where he is a tenor in the choir. He began writing poetry in 2008, all in free verse and filled with inspiration from his life experiences. His heartfelt words are now being shared with you.